Our members come from a Medical background, Allied Health Professional or hold a recognized qualification in Naturopathy, Nutrition, Homeopathy, Herbalism, Osteopathy, and Acupuncture. Maintain a register of suitably qualified therapists. Ensure the professional representation of Ozone, which is governed by the Ozone Society’s Constitution, Code of Ethics, and requirements that embodies the educational standards, course pre-requisites, membership by exam, and interview. Continue Professional Development, therapist support, compulsory professional indemnity Insurance, Health and Safety Standards, and Professional Conduct. The Ozone Society continually develops the monitoring and progress the standards in Ozone and Oxygen in the UK, Europe, and internationally. Ensure the training of Ozone is provided by suitable and experienced members. The Ozone Society will set the minimum standards in education through our teaching syllabus. Set the course pre-requisites for students and employ external auditors and examiners to verify all processes. Ensure all Health and Safety requirements and training are certified and complete by employing external auditors and examiners to verify all processes. Our well established protocols ensure safety and confidence to the public with registered practitioners. 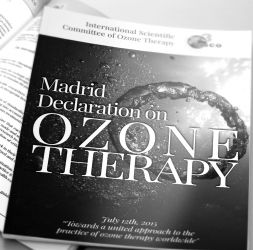 To maintain and continually improve professional standards in Ozone Therapy in the UK, Europe, and internationally and to achieve the best practice for therapist and assurance of safety for the public. Provide an educational platform for the general public and to ensure safety and accurate information on the practice of Ozone Therapy. Represent suitable, qualified, and trained Complementary Therapists, Registered Nurses, Clinicians, Allied Health Professionals, and Medical Doctors in the practice of Ozone Therapy. Ensure Best Practice and Patient Safety, Standardizing Non Clinical and Clinical Methods of Application of Ozone Therapy, Health and Safety in the use of Medical Oxygen, and Medical Ozone Gas. Specialise in Non Clinical Methods of Applications for Complementary Therapists. Continue Professional Development (CPD) and Training organized by the Ozone Society. Each Ozone Society Members has access to a support zone for Ozone Therapy and a resource of clinical reviews, research data, and discussion. Provide every member a gateway to advertise their practice, contact information, website and photo on the Ozone Society’s website for search requirements for the general public. A resource for Research and Development, Innovation and Technology for Medical Ozone in the field of Complementary Medicine.